So. Over there on the right. The parrot rescue where I volunteer has upgraded to an organization page on Facebook. There isn’t much content there now, but I expect the Merry Band of Internet Addicts will be pulling together soon to make it interesting. Back in the day, I meant to make a habit of profiling adoptable birds on my blog. Like, blog a story about one every week when I came home from the rescue. Obviously, it didn’t happen. I hope to use Facebook for more things like that. 24 hours after launch, and we have 11 Likes. Better get to work. In one of the many, many articles about the separation of the Schwarzeneggers, there was mention of the website Maria Shriver launched to talk about things that matter to her. I hadn’t heard of it before, so I clicked over. Links to her books, links to her causes, links to her social media avenues. And the blog. That’s not what the Situation Room looked like on The West Wing. Isn’t is it cool that the President isn’t the Center of the Universe here? Shriver posted her thoughts on that. I like her. I realize that she is a public person and we’re all going to speculate about what happened in her marriage. But while I am doing that, I think I will also read her blog. So I signed up. Then I went to look at the two organizations for the month of April. This is how they get you. How do you choose between The Starlight Children’s Foundation and the Walkabout Foundation? You flip a coin. Then blog about both. Look me up if you decide to join. My profile is here. As I have become more active volunteering, I am more aware of how much time, effort and money are required to keep charitable organizations going. I am not good at this fundraising stuff – this asking for money. 2. The Refuge, as an all-volunteer organization, isn’t exactly speedy in acknowledging gifts. Crowdrise.com is a website that is part social networking and part fundraising tool. I can set up all of the groups that I support and point people to it if they would like to sponsor the efforts. This is particularly awesome for me because I rarely have an event like a walk/run (although the Refuge is trying to pull one together for this year) or a food drive as an excuse to spread the word around. Crowdrise spotlights the efforts of the average volunteer. They also run contests and have some kind of point system for the competitive people. So that’s fun. I like that one can use a credit card to make a donation, and get immediate documentation. And I as the participant can also record donations that I receive offline. I set up my page, which you can find here. I have some more building out to do, but I think this is a good start. If you are using it, please let me know so I can check out your profile! William, who blogs at Philanthropy in Motion, took the lead from Carlo Garcia and is writing about daily donations to worthy organizations. His angle is a bit different. First, his focus is primarily on children’s charities. Second, he takes inspiration from the honorary days (and months) celebrating different causes. He posted today about Project Linus, in honor of Stress Awareness Month. Check him out! It is particularly precious to me because Dallas died far too young and I don’t have many pictures of her at all. 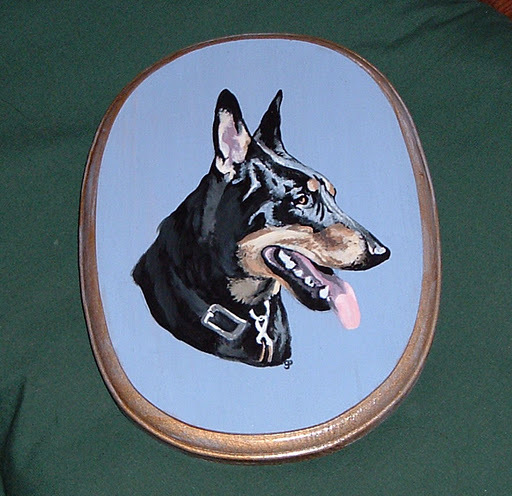 It is painted on a wooden plaque from a digital picture that my mother, Kay, took and e-mailed to her. Side Note: Kay wants you to know that you will not find this work featured on the web site because it was Miss Gayle’s First Commissioned Portrait. Christmas of 2004, I believe it was. As though I should put it in a vault to sell when she hits the Big Time. As if I would ever sell a portrait of my dog! I like Blogging Communities, because that’s where you find..you know..people that like the same stuff that you do. Since Thirty Something Bloggers seems to have gone inactive and Chicago Bloggers seems to have disappeared off the face of the Earth, I started looking around. I have an account with Blogher, but that community is a bit..intimidating. Miss Busy pointed me to Book Bloggers. I can’t really call myself a “Book Blogger”, since I write about lots of other goofy stuff. But several of the people on Booking Through Thursday participate, so I signed up. Badge to the right.